Yes, I know it’s not a brand new video, but I just happened to check it out so piss off. Be warned, this is Top Gear magazine, so this is an ACTUAL review, there wasn’t a single explosion, nobody fell down, and there wasn’t even a drag race. Despite of all of that, or maybe because of, I actually found this video interesting. He does hit on the quality of the car, but as it’s a review, duh. You kind of have to. My impression of the car itself… Fair warning, I have yet to have the opportunity to personally drive it, but from this video… I don’t like it. The exterior is definitely nice, I’m sure the interior is a comfort and a joy, but to me, it looks cheap. I loathe the giant tablet bolted to the dash, it’s ridiculous. If the centerpiece, basically the whole concept of your car is going to revolve around this interactive touch screen, MAKE IT LOOK LIKE PART OF THE CAR. This thing is an afterthought, and I hate it. Some of the easter egg features he covers too, maybe I’m just getting old and bitter, but they’re just pointless faffery. Which, yes, I understand that’s the point, but why are they there? Is it because the car isn’t entertaining enough in itself? Or is it fully just there for something to fiddle with while your autopilot tries to not kill you and a bus full of children. The one thing I absolutely can NOT overlook in this video is when he discovers More Cowbell, yes, I understand there is a cultural difference, but, I mean, it’s MORE COWBELL, He even says it’s the worlds most annoying sketch. 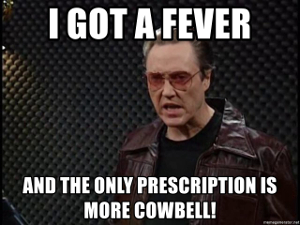 More cowbell is SNL’s most legendary sketch, and Will Ferrell and Christopher Walken are national treasures! So to you, Jack Rix, I say, Guess what? I got a fever! And the only prescription.. is more cowbell!